Tracy Stevens, VP of Product and Design at MyCase, talks about cloud based practice management software and product design. 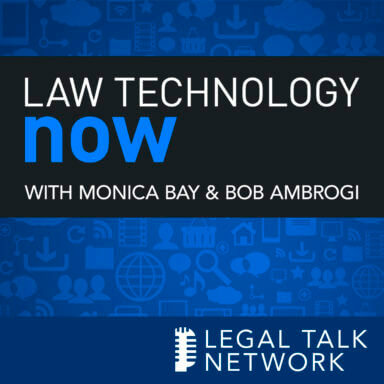 In this episode of Law Technology Now, host Bob Ambrogi talks to Tracy Stevens, VP of Product and Design at MyCase, about cloud based practice management software, product design, and what sets MyCase apart from the competition. They also discuss MyCase’s client portal and why this technology is valuable to lawyers. Tracy Stevens is the vice president of Product and Design at MyCase, where she works directly with the development teams to ensure that they’re building software that will delight customers. Laurence Colletti: Hello listeners. It’s Laurence Colletti, Executive Producer of Legal Talk Network. I want to tell you about one of our more hilarious, yet still very informative podcast called Thinking Like a Lawyer. Twice a month host Elie Mystal and Joe Patrice from Above the Law dive into what it’s like to see the world from a lawyer’s perspective. Meaning they jabber on about politics, current events, this, that, and the other, sometimes with the guests, and sometimes not, but if you are looking for a filterless podcast, check it out, Thinking Like a Lawyer on our website at HYPERLINK “http://www.legaltalknetwork.com” legaltalknetwork.com, in iTunes, or on your favorite podcast platform. Monica Bay: Hello. I am Monica Bay. Bob Ambrogi: And I am Bob Ambrogi. Monica Bay: We have been writing about law and technology for more than 30 years. Bob Ambrogi: That’s right. During that time we witnessed many changes and innovations. Monica Bay: Technology is improving the practice of law, helping lawyers deliver their services faster and cheaper. Bob Ambrogi: Which benefits not only lawyers and their clients, but everyone. Monica Bay: And moves us closer to the goal of access to justice for all. Bob Ambrogi: Tune in every month as we explore new legal technology and the people behind the tech. Monica Bay: Here on Law Technology Now. Bob Ambrogi: Welcome to Law Technology Now. This is Bob Ambrogi and I am speaking today with Tracy Stevens, Vice President of Product and Design at MyCase. Welcome to the show Tracy. Tracy Stevens: Thank you so much for having me. Bob Ambrogi: And I am actually here in the MyCase offices in San Diego today so this is a special treat for me. Tracy, just for those listeners who might not know what MyCase is let’s start there, tell us what MyCase is. Tracy Stevens: Sure. MyCase is a legal practice management software. It’s cloud-based and it really just helps lawyers manage their practice and does everything from time tracking to case management, billing and communication with their clients. Bob Ambrogi: And you are the Vice President of Product and Design, what does that mean? What do you do here? Tracy Stevens: I have the best job of anyone here. What we are responsible for is basically understanding our customers and figuring out what we want to build into the product, prioritizing the things that we work on and working with the developers to make sure that we are delivering things that are really important to our customers in a way that’s going to delight them and make their jobs a lot easier. Bob Ambrogi: Well, I hope we can talk a little bit more about that as this interview goes on, but let’s talk a little bit more about you, how did you come to be at MyCase and what did you do, what’s your background, what did you do before you were here? Tracy Stevens: So I came to MyCase, it was really serendipity. I had someone that I used to work for at another company who was a friend of the guy who was the general manager of MyCase at the time and they talked about looking for a product person in San Diego. So we have our product and design and dev team located in San Diego, the rest of the company; our sales, marketing, and support are in Santa Barbara. MyCase was founded in San Diego and when they were looking to fill that product role, he reached out to my friend and he said hey, if you are looking for a product person in San Diego, you might want to talk to Tracy, and we talked and really hit it off. We had a lot in common in terms of our product philosophy and all of those things and so it was really a good match. Bob Ambrogi: What is that — when you talk about a product philosophy, what are you talking about, what kinds of philosophy do you bring to products in general? Tracy Stevens: Well, I think again it’s an alignment with AppFolio, who now is our parent company and how MyCase was founded, but just a really strong focus on the customers and AppFolio has one of its corporate values that says listening to customers is in our DNA. And I just think that’s so important in terms of having a really strong product and having the ability to focus on customers as kind of the foundation to that. And it’s one of those things, I have been doing product management for almost 20 years now, and to be honest, I was getting a little cynical about companies and the ability to really do it the way that you think that it should be done. There’s always a lot of other pressures and influences and motivations that happen inside companies and I was wondering am I just being idealistic and then this opportunity came around. And I have been here, it will be two years in September and the honeymoon is not over yet. I am really enjoying it here. It’s a great company. Bob Ambrogi: Good. So this whole area of cloud-based practice management is still relatively new. I mean the first of these products only came along I want to say five, six years ago. I think Clio and Rocket Matter were the first two in this space and MyCase was very soon after that, once it came along very quickly after that. But I think a lot of lawyers are still on the fence about using a practice management platform or maybe uncertain about why they even should. When you talk to lawyers, what do you tell them about why this kind of application is important to them and why they should use it? Tracy Stevens: I think you are right. I think people just start working the way they work and it’s really hard to think about how doing something a different way is going to help you or make things easier for you. And so we often just talk. I mean really the easiest way is to show. You can talk and talk and talk, but I think lawyers like other consumers, they have had enough of being talked to and talked at and it’s easier to just demonstrate to them, kind of let me show you what we mean. And I think seeing the integration between all of the different pieces of the product and the way that it creates less rework for them to have to do something in one program and then transfer some of the information over to this other program and keep moving information around, to have things work seamlessly amongst the different sets of functionality really just saves a lot of time. It reduces errors. It gives a lot of opportunity to have a better interaction with their clients and to be more responsive to their clients. The benefit of it is really different for every person, depending on the type of practice they have, how they run their practice, the type of engagement they want to have with their clients. We see people using different pieces of the product in very different ways to drive different results in their business. And so one of the things that we really try to do when someone says they might be interested in the software is to give them a demo, a very tailored demo based on their own needs of their firm, because that’s where they are going to see the value. There’s so much in the product and not every piece is as relevant to everyone depending on what they are trying to get done. Bob Ambrogi: Again, as I just said, there are other companies in this space obviously and sometimes it seems like there’s a new one springing up every other week. There have been a lot of companies coming into this area. So what’s your kind of elevator pitch for why MyCase over any of the other products in this space? Tracy Stevens: Right. So I won’t even argue with you. I agree that there’s a lot of competitors and there are new ones springing up and the reason that new ones are springing up is because there’s a lot of opportunity in this space. There’s a lot of needs that our customers have of things they are trying to get done and they are looking for solutions to help them to be more competitive, to be more efficient. And most of the competitors, the ones you mentioned and some of the others, I think it is a pretty level playing field in terms of this idea of kind of check the box. Everybody has to have this long list of functionality and just to be a player, you have to check the box and show that you do these certain things. And to a large extent you are right, I think a lot of customers in this space view the products as substitutes for one another. And so what I would say about MyCase specifically is that there’s a few things; one is that the way the software works together. We get a lot of comments about the ease of use of the software. Especially customers that have come from other software, they say MyCase is a lot more intuitive, it’s a lot easier to use, it’s a lot easier for me to figure out how to get up and running and be successful with it. So we take a lot of pride in that. We also get a lot of feedback about our Client Portal. I think customers are looking for ways to better interact with their clients and whether you are trying to expand geographically into other areas and using the Client Portal as a way to do that or you are trying to be more efficient or you are just trying to provide a complement to really great hands-on high touch service, the Client Portal can meet those needs. And so that’s kind of a feature where I think we do stand out amongst our competitors right now. Bob Ambrogi: So start with that, because again there may be some listeners who haven’t ever worked with a Client Portal or don’t know what that is. Tracy Stevens: Oh right, right. So a Client Portal is a secure communication vehicle for you and your clients. You can invite them to the portal and then it gives them a safe, secure place to log in and see the details of their case, whatever details you want to share. So not everything gets shared with them, you share on a one-off basis, if you want to share an event with them, if you want to share a document with them. There is a messaging app. And so it becomes a centralized place where all the information about their case exists. They can access it 24 hours a day. With the messaging tool, it helps them feel like they can engage with you when it’s convenient for them and customers can respond when it’s convenient for them to do so. And so it really simplifies and keeps everything in one space which makes it easier for everyone to interact with each other in that engagement. Bob Ambrogi: And the security is a key to that as well. I mean, there has been a lot of — just an ABA Ethics Opinion recently on the steps that lawyers have to take to ensure the security of their client, confidentiality of their client, communications rather and being able to go through a portal kind of alleviates a lot of those problems, because you don’t have to worry about whether to encrypt email and whether to encrypt attachment and that kind of thing. Tracy Stevens: Exactly, exactly. And we have had a number of people reach out to us both customers and prospects after that. I don’t know if it’s called a ruling or just an opinion. Bob Ambrogi: Yeah, an opinion, it was an opinion. Tracy Stevens: Yeah, yeah, what the technical term is. But yeah, we had a number of customers reach out to us to understand that better and to understand if the Client Portal would be something that could help them with that, and we have seen usage amongst our own customers really take off. We have done a lot of improvements to the Client Portal over the last six to eight months and I think it’s a pretty great experience. Bob Ambrogi: I was going to ask you about that. I have actually heard, not from you and not from MyCase, but I have heard some other practice management companies that I have spoken to say it can be hard to get lawyers to use the portal or to want to use that feature of it that even the lawyers themselves, let alone the clients, don’t necessarily understand the value of it. Have you seen that at all? Tracy Stevens: Yeah, for sure. And I take blame for that, because I feel like if we haven’t done a great job of helping our customers understand the portal and what their clients will experience, obviously the portal is going to be a big reflection of them and their firms, and if we haven’t done a good job of helping them understand what that is, then shame on us. And so that’s where a lot of our focus has been and helping to educate our own customers about what the portal is, how they use it. I was just on a customer visit last week with two of my coworkers, where they said they wouldn’t want to use the portal because they didn’t want to share everything about the case with the client. And so we had to tell them, well, it doesn’t automatically share everything about the case, you choose what you want to share with them. We have gotten a lot of feedback about the portals. It’s a bit of a black box. I don’t know what my client is going to see, so we have done a lot of work to help them at each stage understand like what the client experience is going to be, what the client is going to see in that process. And so there is still a lot more work to do, but the good news about having a lot of customer interactions and really understanding, we reach out — we have an entire team here who is focused exclusively on the Client Portal, may talk everyday to customers, and so the more we learn about how our customers are using it and finding value, the easier it is for us to turn around and help demonstrate that value to customers who aren’t using it or poor prospects. Bob Ambrogi: So in 2015 the parent company AppFolio, which owns MyCase, went through a public offering. It was unusual in the legal area, although AppFolio was not a — their other products are outside I guess the legal industry, although they probably kind of crossover into them in some ways to deal with property management, real estate management, but it was still unusual to have any kind of a legal startup or legal tech company being involved in an IPO of any kind, because it just hasn’t happened much in the legal area. I am wondering if you think that the fact that AppFolio is a publicly traded company brings any value to the end customer. I mean do your customers get any benefit from the fact that this is owned by a public company as opposed to any other kind of company? Tracy Stevens: Oh, absolutely. I mean I believe so because this is — one of the things, if you look at the ABA Tech Survey and you look at the reasons that customers in a space cite when they say they are evaluating companies, they talk about the reputation of the company and the stability of the company. I think anytime you are talking about cloud-based providers, there is that sense of who are these guys and who has my data and are they going to be around for the long-term. And so I think I can’t speak for our customers in that way, but what it would say to me is that this is a more stable company, it’s a well-capitalized company, it’s a company that’s going to be around and it’s a company that I can trust and partner with, because we are going to grow and evolve together. Bob Ambrogi: One of the things that kind of spurred this interview was a column I wrote, I think at Above The Law about kind of urging tech companies to take a holistic approach to product design and to think more about the workflow, think about how their products fit into a lawyer’s overall workflow. Niki Black, who works for MyCase, what’s her title, she has got a wonderful title? Bob Ambrogi: Technology Evangelist, okay, yeah. That’s the title I want. She wrote a column kind of taking issue with my column. I don’t think we actually disagreed all that much, I think maybe I wasn’t all that clear in my first column, because she seemed to think that I was suggesting that there was some advantage to approaches taken by other companies. I mean within this practice management area, different companies have taken different approaches to how they build out the features of their platforms. Clio, for example, not to talk about the competitors, but Clio has pursued an approach of doing a lot of integrations with third party vendors so that they have a sort of core set of features, but if you want credit card payment processing or any of a number of other things, you end up doing it through a third party integration. It seems like MyCase has taken an approach of more focusing on building it rather than buying it, so to speak, and you have integrated credit card processing, you have your own e-payment system, I mean just an one example. So what is sort of — how do you view what your approach is to building a practice management application versus how like a Clio might do it or something else? I mean what is your overall kind of philosophy about how to approach this? It’s a long-winded question. Tracy Stevens: Yeah. There is a lot in there. I was trying to think of like where do I want to start with that. So I would say I kind of had two fundamental thoughts or reactions to what you just said. One is that I don’t start by thinking about integrations or not integrations, I start thinking about important customer problems and then how do we solve those problems, how we want to solve them. And part of my bias I guess in how we solve those problems is that I believe that all else being equal our customers do want a single, all-in-one platform rather than having to piece together a variety of third party tools and applications. So I think the key phrase there, all else being equal. So it really depends on what the problem is and is there a solution that’s kind of predominantly used today or is this something that we would be creating something to solve. So there is a lot of different factors at play, but our feeling is if we can do something well, our customers would rather see it as a holistic product, because as Niki pointed out, we learn a lot of things about these integrations that you don’t see in the marketing materials. And at Legaltech and at TECHSHOW I have had people talk to me. I have had vendors who are integrated with some of our competitors tell me about the problems with those integrations. And I don’t need to go into detail in that here, that’s not my intention, but the issue is integrations are tough to do well, and what I learned that I didn’t know before is that integrations that aren’t done very well can actually increase the risk to the customers, because there is data that could get lost, there is things that don’t transfer in the way that you think they should and other issues. There was one vendor in fact that told me of all the customers that use both products, only 10% actually use the integration, and I thought that was startling. So my feeling is we want to figure out important things and we want to solve those things really well, and that if we can solve them on a single platform, that’s what our customers would prefer, because they don’t want to have to deal with piecing it together, wondering if it worked, wondering what happens when one updates and does the other one update. When something goes wrong who do I call, that again is something that we pride ourselves on. We have great customer service and customer success. When people need support we give them one number to call and we want to be able to take care of those things. So we don’t want to put our customers in a situation where we are saying, you need to call them and they are saying, no, you need to call MyCase. We really want to make sure we are delivering a solution that meets their needs. So we do have some integrations and we do have a philosophy of, if that’s the way to solve the problem, we are not opposed to it, but I don’t believe our customers want just easier ways to integrate with 12 different pieces of software. Bob Ambrogi: Yeah. And I don’t know why actually Niki read my — I certainly did not mean that I was promoting integrations over taking a cohesive and comprehensive approach, because obviously from a user point of view the more everything is in the same platform, the better off you are. And then there’s also the price issue, which is something else I have written about actually, but when you are doing these integrations for the most part you are having to pay not just for your monthly subscription to the practice management platform, but you are paying for your monthly subscription to whatever it might be out there that you are integrating with. So those can start to add up. And again, I have used the example before of the e-payment processing, but I think you are one of the few platforms where that’s just part of your subscription price. You are not paying extra to be able to offer e-payments. I mean you pay the processing fees or whatever, but you are not having to pay an extra subscription to another company, whereas I think almost all the other companies are doing it through external subscriptions. Tracy Stevens: Right. And I think that’s a great example, because building a payments platform is tough and it’s an investment. We are making a big investment in our payments platform because we believe getting paid is a very important problem to our customers and that by building it right into the product, it gives us a lot of flexibility with things that we can do. Like what we have done recently around payment reminder functionality and there’s a lot of things that we are talking about related to payments that we think we are going to get a disproportionate benefit by owning that platform and being able to deliver more value to our customers and not being reliant on a third party and whether or not that’s in their product roadmap to deliver that functionality to our customers. So that’s a great example of something where it’s very important so we want to own that, we don’t want to outsource that. Bob Ambrogi: Yeah. So what is your process for designing that product roadmap and for thinking about what enhancements to be focusing your attention on? Tracy Stevens: It is more art than science I will tell you that and there’s a lot of different factors that go into it. Like I say for the most part, it’s really understanding what’s important to our customers. I mean it sounds simple and it sounds — I am laughing because I am thinking back to a conversation we had at Legaltech. I think where you said everybody says that, so how are you guys different. Bob Ambrogi: Did I say that; I was just thinking that again. Tracy Stevens: The way that I assume that we are different is because we are talking to our customers every single day. We read every single piece of feedback they send us, we reach out to them, and I have got some great examples; I don’t know if we will have time to share them, but I think we surprise customers by the fact that they will send us a piece of feedback and within 24 hours we are calling them back to get more information. They say we are in beta right now on some new mobile apps and if they give us a piece of feedback on the mobile app and then the product manager of the mobile app calls them back and says, hey, we are doing that in the next release of the beta, can I sign you up for the beta, and they are blown away. Or someone that was just talking about how we didn’t have a great process to request payments into the trust account and we were just about to roll it out, so the product manager called her back and she was like, oh my gosh, this is perfect, this is amazing. This is what I have been waiting for. Those are the types of things that I think really let our customers know that we are investing in this product, that the product is evolving, that they are a part of how the product evolves. There are more formal processes that we use for really making sure we understand our customers and we are delivering solutions that are going to really meet their needs, but for the most part I think just having a really good sense of what’s important and what’s going to bring the most value to those customers is kind of how we decide what we are going to do. Bob Ambrogi: So can you tell us maybe some recent enhancements you have delivered or anything coming down the pike that you can talk about at this point. Tracy Stevens: Yeah, absolutely. Like I have said, we have had a team that’s dedicated to the Client Portal. We have made a ton of enhancements there. We have improved the look and the feel of all the communications that go out to clients, again because we know that it’s really important to them to be a good representation of their firm. We have given them a lot more transparency to what customers are doing in the portal. So they can see, did somebody view the invoice, did somebody view the document and make sure that these things that they are sharing with their clients, that their clients are actually engaging. So there’s been a lot of movement on that front. There’s been a lot of movement on the payments front, which we have already talked about. There have been a lot of just smaller enhancements as a way to kind of say, hey, we heard you, we are listening, functionality around multiple timers or some sorting functionality. I feel like there’s so much and I am probably forgetting some of the big ones. Like I said, the mobile apps are coming. Bob Ambrogi: When is the mobile app coming? Tracy Stevens: Well, we are in beta right now. We keep adding. We add additional customers to the beta with each release and the goal is eventually to try to have as many of the customers that are currently using the apps in the beta and kind of using the beta as their primary mobile application, and what we are expecting right now is probably the fall of this year. Bob Ambrogi: You mentioned you have been in product management I think for 20 years, I think you said. I am just curious, in designing products for lawyers versus designing product for, do I want to say normal people, other people, the rest of the world, is there anything specific that surprised you I guess about working in the legal space that you hadn’t seen in product design in other areas that you had worked in before? Tracy Stevens: I have two things that immediately came to mind. I think one is, no, nothing that surprised me in terms of I hadn’t seen before. I think one of the things that was a pleasant surprise was the fact that lawyers are so busy and they bill at very high rates and so I figured it would be more difficult to have interactions with them, meaningful interactions with them, frequent interactions with them. I have found the complete opposite. Our customers and prospects I find are so generous with their time when they feel like they are listened to, when they feel like they are influencing the direction of the product, I found them to be like unbelievably willing and generous to give feedback, which has been great. We have so many teams here that are each reaching out to customers for different circumstances, to get feedback, to get insights, to do qualitative interviews, to review prototypes, and we have never had difficulty getting that feedback, which is great. One of the things that I think is challenging is that especially for a lot of people who don’t use software or they are new to some of these practice management capabilities is lawyers are very set in their ways. They have very specific ways they want things done and they want the software to work exactly the way that their practice works today, and so sometimes it’s difficult to kind of show them a way that might work better for them if it’s not the way that works today. So I think in general we try to recognize that it’s not a one-size-fits-all. Things completely vary, not just by practice size or the type of work that you do, but just the way your firm works or the way you work as an individual. And so we try to build things in a way that allow that customizable approach, but there are certain things where it just doesn’t meet everybody’s needs, but if they could have a little bit more open-mindedness to a new way, there might be a better way for them to get something done. Bob Ambrogi: Tracy, is there anything else coming down the pipeline? Tracy Stevens: Yeah, so we talked about a lot of the improvements that we have done to the Client Portal, to make that a better experience and also help our customers understand what their clients are experiencing. But one of the really exciting things is that we have actually done a full redesign of the Client Portal that’s going to be starting beta test next month and will also be launching sometime this fall. It’s designed completely with the client in mind and based on the things that they are trying to get done and the most common tasks that are done in the portal. And it’s also completely mobile responsive and so it will work on any smartphone, tablet or computer that our customers’ clients are trying to use, which should make it a much more seamless experience for them and get them to engage with the portal more often. Bob Ambrogi: So the client will be able to access the portal directly from iPhone or wherever. Tracy Stevens: Yeah, and they can do that now, but it just was an experience that wasn’t designed for it. So there’s a lot of like pinching and scrolling that happens in the current experience that won’t have to happen in the mobile responsive experience. It will look great on all devices. Bob Ambrogi: Great. We are just about out of time. Was there anything else you were really hoping I was going to ask you about that you wanted to talk about that we haven’t talked about. I would give you the last chance here. Tracy Stevens: Well, that’s a good question. I don’t think so. I think you and I have had some chance to talk at different events and it was just really exciting for me to have you in and be able to show you a little bit more about what we have going on here. I am super excited about some things coming down the road and it’s nice to know that you are getting a little bit of — more detailed insight into that than we have had a chance to share in the past. Bob Ambrogi: Yeah. Well, it’s really fun to be here. It’s fun to see your offices. It’s a very cool looking place here. It looks like a startup, very cool. Well, Tracy, thanks a lot. Thanks for being my guest on the show. Tracy Stevens: Thank you for having me. Bob Ambrogi: We have been talking with Tracy Stevens, Vice President of Product and Design at MyCase. That concludes this show. Stay tuned for another program of Law Technology Now. Thanks for listening. Outro: If you would like more information about what you have heard today, please visit HYPERLINK “http://www.legaltalknetwork.com” legaltalknetwork.com, subscribe via iTunes and RSS, find us on Twitter and Facebook or download our free Legal Talk Network App in Google Play and iTunes. The views expressed by the participants of this program are their own and do not represent the views of nor are they endorsed by Legal Talk Network, its officers, directors, employees, agents, representatives shareholders, and subsidiaries. None of the content should be considered legal advice. As always, consult a lawyer.